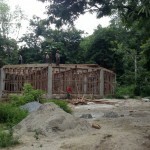 The University of Global Peace is currently undergoing building construction. 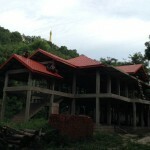 It is located a short walk away, about 100 meters away from Oo Yin Pariyatti Monastery, at the foot of Yankin Hill Mountain, about miles east of Mandalay. Sayadaw’s vision and goal of uniting the world, with his principal motto of, “Global Peace & Harmony ” is an emphasis on bringing about harmony and peace within all groups of worldly people, despite caste, race, gender or religion. The newly opened College of Global Peace and also the University of Global Peace have been built with this principal in focus, for all people to be able to study the Dhamma studies and receive a high standard of education. The University of Global Peace is due to be complete by the end of 2016. The Degrees offered at the The University of Global Peace are a continuation of studies including the Diploma in English currently being offered at the College of Global Peace. Students who have finished other Degrees, or Diplomas elsewhere will be eligible to apply to study the Degrees offered at this university. There will be a wide range of a high standard of Degrees offered at the University of Global Peace, on various Religious Studies and other Degrees, with native English speaking teachers invited to live and teach at the University. Sayadaw U Jotika states below why he decided to establish The University of Global Peace At Yankin Hill. “My ambition is to decrease suffering for all beings in human society and help increase peaceful life for all. Every person who observes morality can make a peaceful life not only for oneself, but for others in the surrounding environment. I feel that the word Peace does not depend on any religion, e.g. Buddhism, Christianity, Islam or Hinduism. Peace is dependent upon how one observes morality. 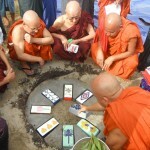 When the majority accept and observe strong morality, this will enable really peaceful Dhamma. Sayadaw’s aim is to allow students from all nationalities, all religious backgrounds to attend, to study an open range of Religious subjects. This objective includes having experienced scholars from various religious groups to lecture classes and spread awareness of theory teachings of their religions in an open, peaceful, non-dogmatic way. This will allow an opportunity for students attending the University of Global Peace to learn and develop their wisdom, awareness and increase understanding, tolerance, respect and appreciation of other religions. 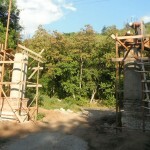 The front archway pillars being built into construction. 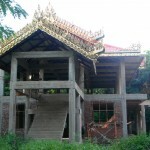 One of the main buildings still in construction. The foundations the main building of the University of Global Peace in progress. The foundations for one of the University buildings in progress.